We get the privilege of the struggle – the daily hustle of making a difference. It was Fall of 2011. I had started Yellow Leaf Marketing six months earlier with zero clients and things were moving slowly, to say the least. Through a few friendships and mutual connections, I was offered a job at a very reputable company in Tennessee. I had a lot of respect for this company and the work they did. The position being offered to me was a new one — one that was being created just for “a person with my skillset.” I felt humbled, honored, and really intrigued. Soon in a supernatural chain of events, God used a lightning bug, yes a lightning bug (for those of you from up North, that’s what we call fireflies in the South!) as a sign to show me that I was to stay at YLM — to stick it out, put in the hard work, and hustle to make something out of this. It really is a great story. Next time we run into each other, remind me and I’ll share it with you. The thing is, from that day on, perseverance became such a real and tangible and exhausting and gratifying thing. The grass on the “other side” didn’t look so green anymore. I’m grateful for having to make such a hard decision early on in the life of this business. It truly set the tone for the years that would follow. The work philosophy that we have paired with Perseverance is “Accept Change. It’s inevitable.” It’s true — the only thing that remains the same is that everything changes. We must learn to persevere through change because if we don’t, we will cease to thrive. Perseverance takes many forms. I think there are times that perseverance looks a lot like patience. Other times perseverance looks like hope. Perseverance looks a lot like obedience. Perseverance looks like focus. Perseverance even takes the shape of humbly and quietly just doing the work. There are also times when perseverance looks like all out war — like beating your head up against a wall. In my opinion, the common thread that runs through all of these forms of perseverance is “purposeful.” Purposeful patience. Purposeful hope. Purposeful obedience. Purposeful focus. And so on. There is an end-goal and when we’re persevering toward that goal, we can’t afford to “coast.” We must be purposed in pushing forward. If you’re just coasting in your work, you’re not persevering. If there isn’t anything to persevere through, I’d argue that your work may even lack purpose. 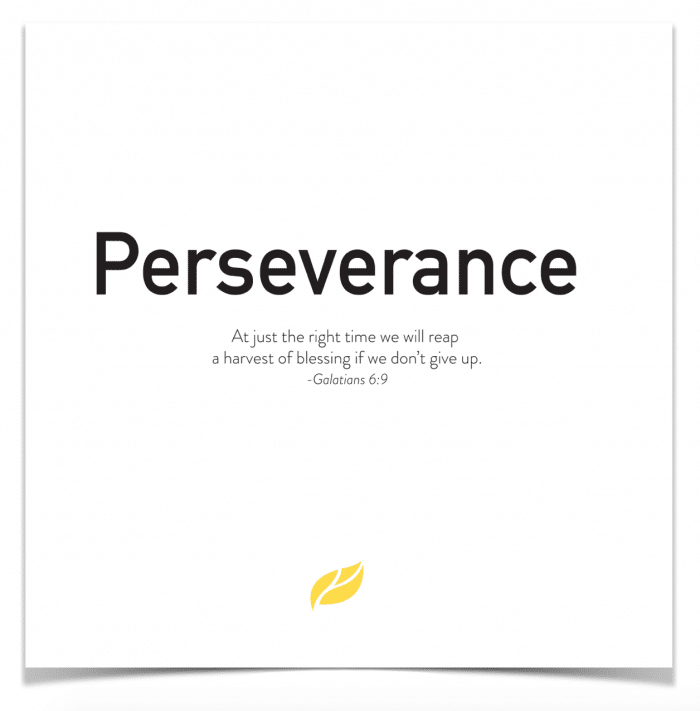 At Yellow Leaf, we chose perseverance as one of our core values because there is so much adversity facing the work every day. When we set out to serve ministries, foundations, nonprofits, and cause-driven businesses, all who are truly doing so much good, it’s unbelievable how much adversity comes against the work and gets in the way of reaching a goal. Imagine that, huh? What is it about not growing weary in doing good and exulting, or rejoicing, in our tribulations and sufferings that is so intriguing? Do you feel that, too? Doesn’t this make you just want to really stick it out to see what that harvest will bring and develop that proven character and hope? Man, such great promises. So friends, this week in our work, my prayer is that we’ll persevere just a little longer. Push a little more. Work with a heart full of hope. Not begrudgingly, but faithfully — knowing that there is a harvest to be reaped and character to be developed.